Cluster bombs are good at destroying lots of things spread over a huge area. What they’re not so good at is always exploding, with the sub-munitions falling to the ground and failing to detonate. It’s a horrific reality that people around the globe have to live with, where a curious child or a wrong step can mean the loss of a limb or far, far worse. Now the Pentagon is planning to fix this problem once and for all. 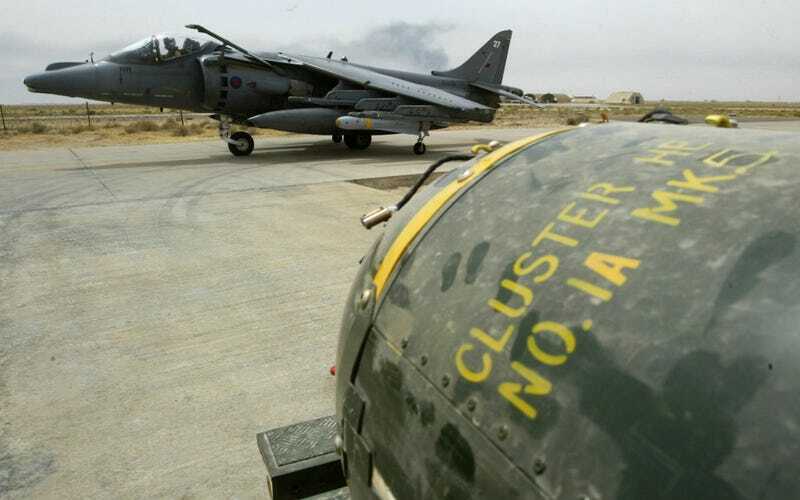 Although some cluster bomb concepts have greatly improved in their accuracy and target discrimination, the traditional cluster bomb is still in widespread use with thousands of the munitions being used since the invasion of Iraq began in 2003. They continue to be a favorite among those tasked with destruction of enemy air defenses (DEAD) in the “Wild Weasel” role, along with battlefield interdiction against formations of vehicles and troops. Even some close air support missions, especially those where the exact target’s location is unknown, benefit heavily from cluster munitions. As such, the demand for the cluster bomb’s affects on the battlefield isn’t going anywhere – the Pentagon is just figuring out a way to achieve the same affects through newer, smarter means. The idea is to not just improve the safety of the cluster bomb’s grenade-like sub-munitions – something that has been tried before – but to eliminate them altogether utilizing non-explosive kinetic projectiles instead. This initiative is in line with a goal set by Secretary of Defense Robert Gates back in 2008 to move away from traditional cluster munitions by 2018. As of now, the most prominent alternative emerging from the weapons development world is commonly referred to as the Cast Ductile Iron Bomb. The principal is fairly straight forward: it uses high-speed hot cast iron shrapnel to tear apart the enemy and their material instead of miniature high-explosive bomblets. This way, once the bomb has detonated, and its pieces fall to the earth and cool, they are just piece of cast iron, not ticking time bombs that often look like colorful toys. It’s doubtful that such a weapon, at least in its first iterations, would cover as much of an area with destruction as a dispenser concept like the popular CBU-87 Combined Effects Munition currently in service, but upgrades in bomb guidance should compensate for this overall capability loss. Even today, the U.S. mainly uses guided cluster bombs in the form of the Wind Corrected Munitions Dispenser (WCMD). This is basically a guided tail-kit attached to existing cluster bombs that uses an internal inertial guidance system to fly towards its target area. The nice thing about a Cast Ductile Iron Bomb is that it should be able to be molded around current 500- and 1,000-pound general purpose bomb (Mk 82 and Mk 83) dimensions. This could allow it to use a standard, or slightly modified, Joint Direct Attack Munition (JDAM) tail guidance kit. The JDAM remains one of the cheapest and most reliable forms of precision air-to-ground weaponry available today. Also, by keeping to common general purpose bomb dimensions, these new “area kinetic fragmentation bombs” would be able to be deployed from inside the F-22’s and F-35’s weapons bay, which could be a huge plus. If the Cast Ductile Iron Bomb replacement for a traditional cluster bomb ends up having a smaller effective blast area then its counterparts, and if larger areas are needed to be attacked – say a spread-out formation of infantry moving across the battlefield – more weapons can be used to offset this handicap. With more accurate guidance then its WCMD counterpart and with proper integration into an aircraft’s targeting and mission computers, a pilot or weapon system officer could select an area they would like to “cover” and then assign proper coordinates and fusing information to multiple guided Cast Ductile Iron Bombs. Thus achieving a similar affect as a traditional cluster bomb, which is really just a dispenser for bomblets, without the cluster bomb’s political or moral baggage. The basic Cast Ductile Iron Bomb would most likely be akin to a general purpose bomb body made out of iron and possibly scored for an evenly dispersed fragmentation upon detonation. There are multiple requests for this type of weapon being tendered by the DoD today, and there is even one for the Small Diameter Bomb which could give any combat aircraft a standoff area affects weapon. In the future, more elaborate designs could be put into service, including ones with a complex array of pre-separated individual projectiles and advanced fusing options. It is pretty amazing to think that the traditional cluster munition made it as far as it has in U.S. service. The Convention On Cluster Munitions has been signed by 92 states since its drafting in 2008 and the U.S. isn’t one of them, even though the majority of our allies are. But should the Cast Ductile Iron Bomb be validated in testing, it along with its “smart” sub-munitions cousins, may finally allow the Defense Department to give up one of its most effective, but controversial weapons once and for all.